The "best" in heating, cooling, and refrigeration just got better! 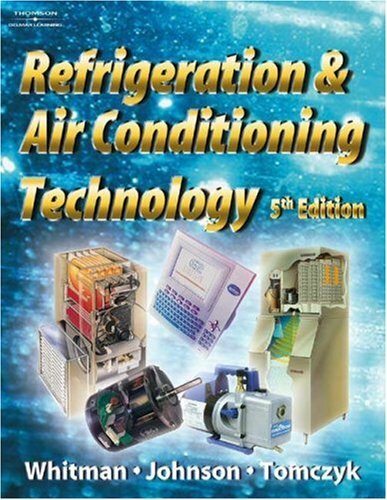 This time-honored best seller has been updated and revised to provide superior hands-on information needed to successfully maintain and troubleshoot today's complex heating, air conditioning, and refrigeration systems. It fosters a solid foundation and understanding of environmental problems and their solutions, and displays a depth and detail of theory, diagnostics, and repair procedures that make this a fitting book for basic HVAC-R education as well as upgrading and certification training for technicians in the field. The fifth Edition includes information on typical operating conditions, and offers ample systematic troubleshooting techniques and scenarios with an eye to improving reader's skills. This book has been developed around the National Skill Standards for HVAC-R technicians as funded by the U.S. Department of Education, and contains easy-to-understand language for grasping fundamental and advanced concepts in the HVAC-R field. A thought for the publisher !!! I have 'borrowed' this book from the library on a number of occassions but at present refuse to purchase a copy. The reason being is that this edition is NOT written for the international market. If and when a full SI edition is printed, I will be amongst the first to purchase a copy AND I will recommend all my students do likewise as this text surpasses that which we currently endure.